Many factors can affect your efforts at conversion rate optimization, and it's hard to keep track of all these variables. We hosted a webinar with conversion experts Larry Kim, WordStream Founder, and Lanya Olmsted, HubSpot Psychologist, to share our top 10 new and unconventional CRO hacks backed by psychology principles that can DOUBLE your leads. We then condensed these tips into an easy-to-read PDF for you to go through and check off before you begin any conversion-related activities. 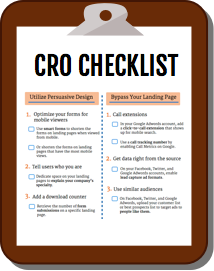 Download this checklist to never miss a conversion opportunity again! By submitting this form, you authorize HubSpot and WordStream to contact you with more content and information. You further authorize HubSpot to pass your information to WordStream for these purposes.